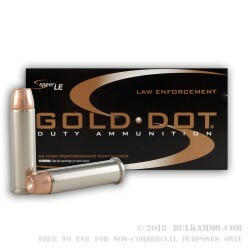 This Speer Gold Dot 357 Mag round with its 125 grain jacketed hollow point bullet is an excellent choice for both self-defense and the varied needs of law enforcement officials as well. 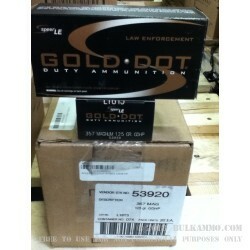 It features a nickel plated Boxer primed brass casing, which is both non-corrosive and reloadable. It further offers a hefty bullet with its jacket bonded to its core. 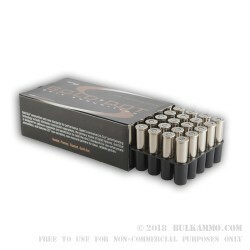 This eliminates core-jacket separation and promotes weight retention, permitting the bullet to keep traveling should it contact cloth or bone upon impact and penetration. Vernon Speer began producing bullets in 1943 to meet the demands of reloaders who couldn’t find the component as the result of the war effort. His company would go on to begin manufacturing entire cartridges, and now Speer’s Gold Dot is placed among the most trusted brands of duty ammunition for law enforcement. It excels in the FBI’s test protocols, particularly in their compound glass angle test.